Leg wax and a bi-ki-ni. I stuffed my true love with the tu-ur-key! 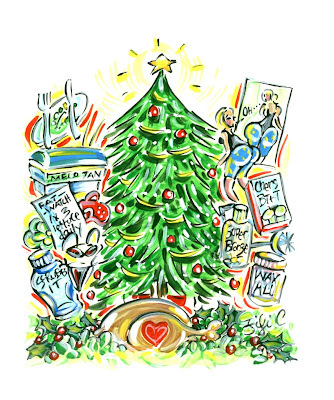 Merry Eating and Drinking to one and all, and may the recession recede as fast as the Pinot Gris. 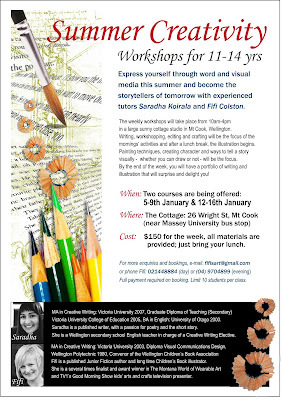 I'm teaming up with Saradha Koirala this January to run workshops on writing and illustration for 11-14 year students- our storytellers of the future. Saradha recently won 2nd prize in the Wellington Sonnet Competition and she, like myself, are both graduates of the Victoria University IIML Creative Writing MA Programme. Saradha will be running the writing part and I'll be teaching the illustration all in my wonderful sunny studio in MT Cook. Here's the flyer; please feel free to pass it on. We are looking forward to a great summer nuturing bright young talent. 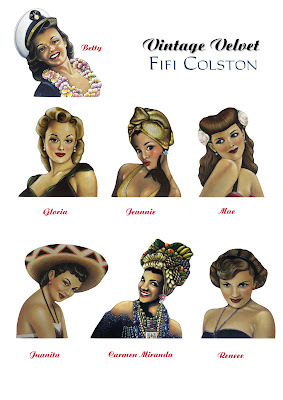 Well here they all are; my Pin-Up Honeys. Click on the picture to see them in full resolution. My favorite is Gloria- which one appeals most to you? I hung them last night with the help of my fabulous other half Adrian- it so helps to have a tall man at your disposal, that picture rail and those hooks were a long way up! 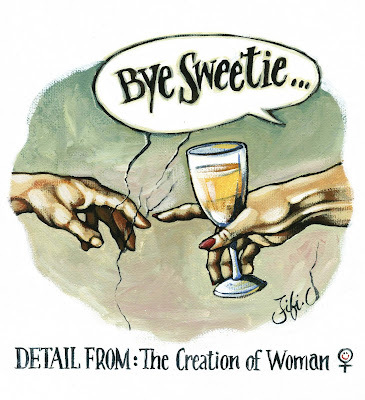 Juanita sold before she even got to the cafe, but tonight is the opening and if I haven't contacted you about it, get your own back and come and drink my bubbly at 6.30pm at the Deluxe, Kent Tce, Wellington. I'd love to see you there!